While spindle-whorls are common archaeological finds, and while there are hundreds of dozens of spindles in all kinds of homes, working or not, the spindles themselves - that is, the sticks - are not something commonly seen for sale on markets. Medieval spindles are usually rather slender with a double-conical form. With as little as two or three millimetres diameter at the ends, and not much more than a centimetre at the thickest place, they are too slim to be turned on just any lathe - the thin stick starts to wobble, making an efficient production difficult or impossible. But spinning with a much thicker double-conical spindle stick, which would pose no problems when turning, will not work as well. Even more important, that stick won't fit the whorls so smoothly. And you want your spindle to fit your whorls, all of them, so you can just change. Hints on how to fix the spindlewhorls to the spindle and how to wind yarn on it can be found here. With the removable whorl, you can for example have three spindle sticks, spin with one until it's full, spin with the second until it's full, and then ply both singles together on the third stick before removing your plied yarn from that spindle, freeing all three again. That will work only if you can change your whorl from spindle stick to spindle stick - and preferably, if you have more than one whorl, this would work with any of your stash. In contrast, most modern spindles are seen differently, with the whorl and the spindle stick firmly belonging together. Most spindle makers just have their own method that will cut out the need for double-conical spindle sticks - often they use a stick that is firmly fixed to the whorl and not conical in shape. However, if you prefer to use and store your spindles the medieval way, here is a spindle stick with the required double-conical form. They are made from wood, using modern machinery, and sanded to smoothness but not treated in any other way. You can either leave them untreated and use them that way or finish them with your choice of oil or wax. The spindles are modeled after a find from Bergen, Norway, 12th century, that has the typical form. They are 11 mm thick at the fattest part, 3 mm slim at the ends, and 27 cm long; each stick weighs about 8-11 gr. The spindles should fit about any whorl, and they are an absolute pleasure to spin with. 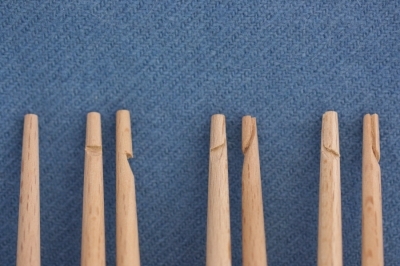 The picture shows the three available woods from left to right: beech, pearwood, and maple. While many of the medieval spindle finds show plain, smooth ends, there is a considerable number of sticks with some kind of notches as well. These notches can help secure the half-hitch around the upper end of the stick. 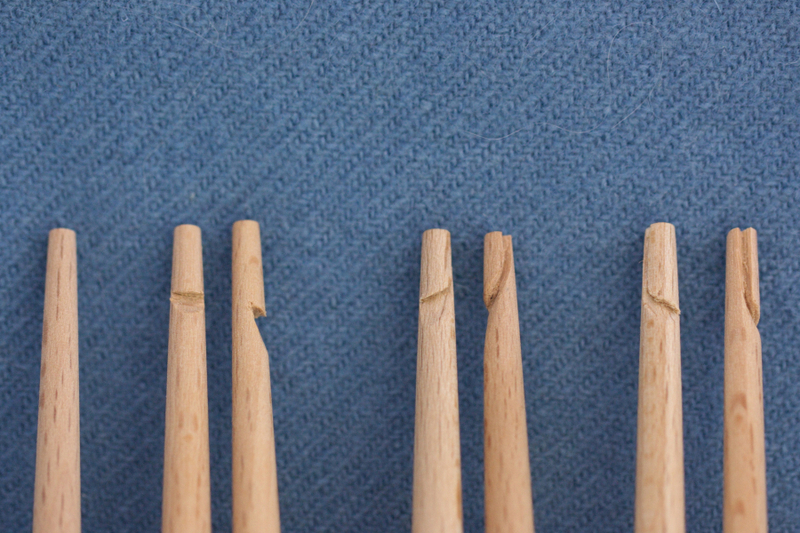 If you would like your spindle stick with a notch, you have the choice between three versions. The notches are oriented after the finds from Coppergate, York (p. 1734 in Walton Rogers, Penelope: Textile Production at 16-22 Coppergate, The Archaeology of York Vol. 17: The Small Finds. York: Council for British Archaeology, 1997). The horizontal notch is slightly hook-shaped and can be used with a half-hitch for both spinning directions. 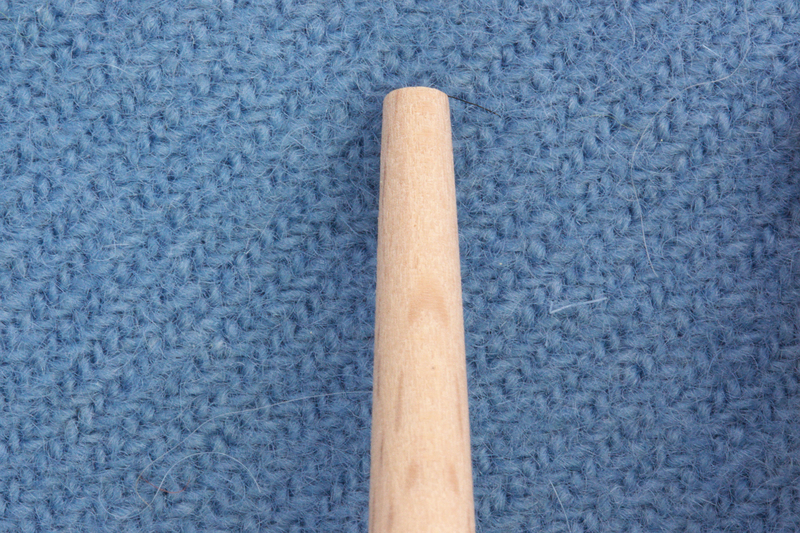 The diagonal notch is combined with a vertical slit running up into the tip of the spindle stick, similar to the upper end of traditional Portuguese spindles with their spiral notch. This notch sort of hooks into the thread and, provided the spun yarn is thin enough, may work without a half-hitch.